Update (Resolved): 9/27, 6:13 p.m. The issue has been resolved, and ITS is unaware of any ongoing problems with search in Google Chrome. 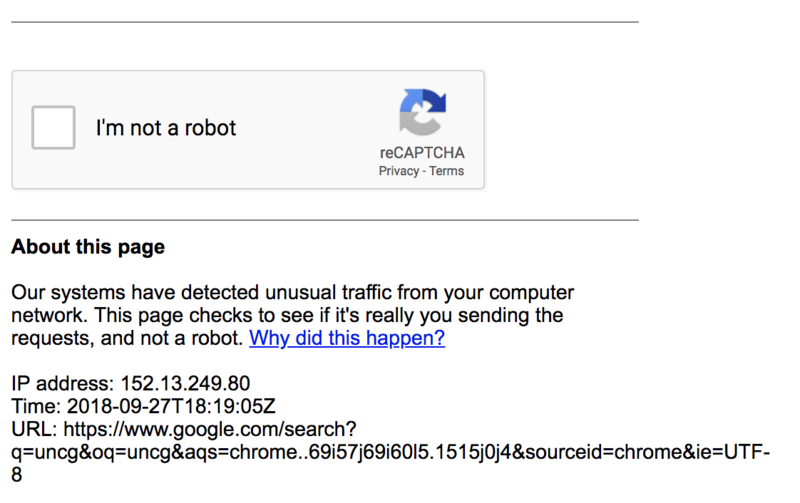 ITS is aware of issues with search using Google Chrome that presents the user with a “I’m Not a Robot” prompt, as pictured below. ITS is working on determining the cause of the issue, but has no timeline on a resolution. Users should click “I’m not a Robot” and proceed with their search. ITS will update this article when more information is made available.